Approximately two million women, men, and children report to the ER for sports-related injuries each year, according to a report from the US Department of Health & Human Services. If you live in the Clear Lake or Greater Houston area and injure yourself while riding a bicycle, playing football, or engaging in other activities, get back in the game with treatment from a board-certified orthopedic surgeon and fellowship-trained sports medicine specialist: Dr. Marilyn E. Copeland, of Fondren Orthopedic Group in Webster, Texas. Call or request an appointment online today. Why do I have a sports injury? Why do women experience sports injuries more frequently than men? Body alignment: Women typically have wider hips and knees that point inward, both of which can increase the risk of injury. Muscular differences: On average, women have less muscle strength and use different muscles than men for many physical tasks, creating greater strain on certain areas of the body. Range of motion: Women are typically more flexible than men and have a wider range of motion, making hyperextension and other extreme muscle stretches more likely. What should I do when I experience a sports injury? Treating your sports injury early increases your chance of a full recovery. If you’re in pain or can’t move a body part, Dr. Copeland can usually see you the same or next day. If you suspect your injury is minor, you can try the RICE protocol: Rest, Ice, Compression, and Elevation. Over-the-counter non-steroidal anti-inflammatory drugs (NSAIDs) are helpful for pain relief. If your injury doesn’t improve within a day or two, contact the experts at Fondren Orthopedic Group. How do orthopedists treat sports injuries? Dr. Copeland and her colleagues take time to learn about your injury through active listening and an in-depth physical examination. Usually, they order in-house X-Rays and, if necessary, MRIs. How can I prevent future sports injuries? As part of your rehabilitation, Dr. Copeland enrolls you in a physical therapy program to help you build strength and flexibility to avoid future injury. Dr. Copeland also provides recommendations on ways to move more efficiently and healthfully. 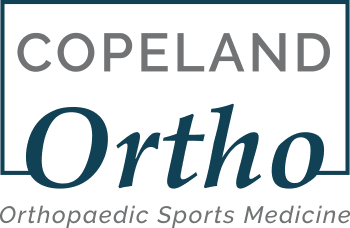 If you have a fresh sports injury or one that hasn’t healed properly, contact Dr. Copeland at Fondren Orthopedic Group by phone or by using the online request tool. Disclaimer: The contents of the CopelandOrtho.com Site, such as text, images, and other material contained on the Copeland Ortho site are for informational purposes only. These contents are not intended to be a substitute for professional medical advice, diagnosis, or treatment. Always seek the advice of your physician or another qualified health provider with any questions you may have regarding a medical condition. Dr. Copeland would be happy to discuss your particular orthopedic needs by appointment in her clinic. Never disregard professional medical advice or delay in seeking it because of something you have read on the Copeland Ortho Site! If you think you may have a medical emergency, call 911 immediately. Reliance on any information provided by CopelandOrtho.com is solely at your own risk. The Copeland Ortho Site and all the content are provided on an "as is" basis.